For me, this is one of the must-haves particularly if you use the car for touring and use motorways. The Laycock de Normanville overdrive operates on 3rd and 4th gear and gives you around 25mph per 1,000rpm in overdrive top. The reduced engine rpm improves fuel (and oil) consumption, reduces noise and places less demand on the cooling system. What's not to like! We need to put a small bulge in the gap transmission cover to accommodate the slightly altered gearbox profile but this is not sufficient to require new carpeting. You also need to consider the o/d switch location. 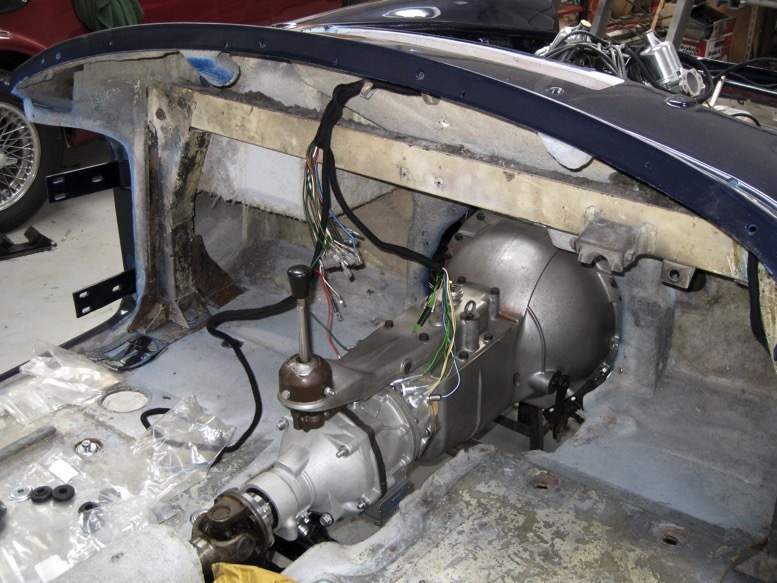 If you have the Triumph steering column, there is provision on the right hand side of the column to install a Triumph switch (see rack & pinion upgrade page.) Otherwise you can install a dash mounted switch such as that used on an MGB. Daimler aficionados may be interested to know that whilst the availability of overdrive as an option was mentioned in the 1959 SP250 launch material, it was never listed as an option after launch and records show that only two cars were built with this feature. Curiously, one of them was exported to the West Indies; an area I would never have thought of as "overdrive territory!" The overdrive unit in place on a ground-up restoration. This picture also clearly shows the A posts and cross beams used on B & C specification Darts.